“Art comes from a creative brain. It’s not about what you see; but how you see it that matters. Therefore, if you don’t have it in you, no amount of drill[ing in lessons], even in the best institution in the world, can make you an accomplished artist,” says Bijay Biswaal, a self-trained artist from Nagpur in Maharashtra. With an unbridled passion for painting, the railway man has successfully carried his works to national and international levels. A ticket-examiner by profession, trains and people have defined his paintings that have brought out the beauty and cultural diversity on railway platforms. While to millions of people, the chaotic life of an Indian railway station seems monotonous and the splendour of the platforms goes unnoticed, Biswaal’s observations capture the moments of passing people in paint, turning them into a personal statement and mirroring the warmth he feels around stations. From Mahatma Gandhi approaching a train and Prime Minister Narendra Modi walking on a wet platform along with his mother to painting a crowded Chennai station showcasing southern Indian filmstar Rajnikanth and a train dropping commuters at Konark temple in Odisha, Biswaal has broken probably all geographical boundaries in portraying how trains in India are not just an important mode of commute, but are a way of life and the heartbeat of any city or town. Painting has been a passion since he was four years old. Born in 1964 in Odisha’s Pallahara village, Angul district, Biswaal recalls scribbling with charcoal shovelled from his mother’s hearth. “I would watch my mother cook with the fire coming out of coals and draw what came to mind. Soon, the chalks gathered from under the blackboard in my classroom became my prized possessions. And much to my mother’s discomfiture, the walls and floor of our house turned into my canvas,” he says. Unlike my colleagues, who whiled away time in rest rooms sleeping or playing cards, I would roam about on the platforms hunting for locations to paint. With time, the tools for sketching changed. Biswaal graduated to colour pencils and then to sketch pens. “This was followed by water colours, which I got to see for the first time at the age of 18, while in college. The summer vacations were the best times as I would get to paint on empty cartons of medicines. Since my father ran a medical store, the leftover white cartons were my target. From Bollywood superstars Dharmendra and Amitabh Bachchan to Hema Malini and Rekha, I made sketches and posters of many iconic figures,” the artist reveals. Strangely, though Biswaal was highly inclined towards art, he did his Masters’ in political science. However, it did not diminish his interest in painting. But owing to his family’s economic status, a government job seemed a necessity for financial security. So in 1990, he joined the Indian Railways. Nevertheless, he continued to paint in his spare time, but the railways did not feature as a theme in his paintings. “I would paint portraits, landscapes and illustrations. On joining the railways, I found my colleagues being quite indifferent to my artistic bent and some seniors cynical and discouraging. Few even made bets as to how long I could continue to paint in the cold metallic railway environment,” he recalls. The job was demanding, entailing public interaction and having no connection with anything creative or artistic. Initially, Biswaal found the environment a bit depressing. But he refused to stay away from the brush, colours and his easel. “I used to carry a small painting kit while on duty. Work took me to different railway stations across many Indian states, including Maharashtra, Odisha and Chhattisgarh. But unlike my colleagues, who whiled away time in rest rooms sleeping or playing cards, I would roam about on the platforms hunting for locations to paint. Instead of well-known busy stations, I preferred the lazy idyllic life of smaller stations like Korba, Bhatapara, Durg, Rajnandgaon, Gondia and Rourkela. Since interaction with the public here was much less, they turned out to by my most iconic subjects,” he says. The artist’s passion was so deep that even during family vacations, he would find time to paint. He turned to his train journeys for inspiration. 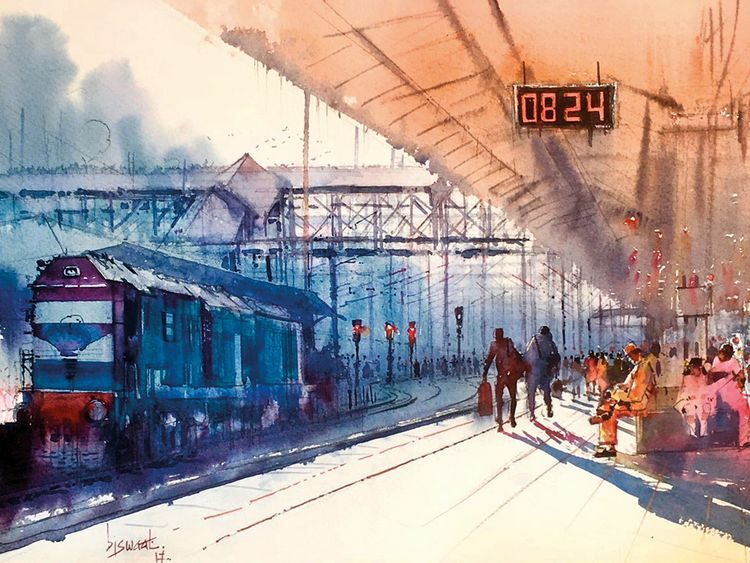 His picturesque watercolours reflect various facets of the ever-busy railway life, including passengers lugging their bags or waiting at the platform for the train to arrive. Often, the atmosphere is cloudy or the platforms are soaked in rain. “That’s because my earliest memories of a railway station remain etched in my mind,” Biswaal says. The advent of social media was a blessing for the artist. His painting of the Odisha rasoi (kitchen) showing an Indian chullah (Hindi for hearth) went viral. 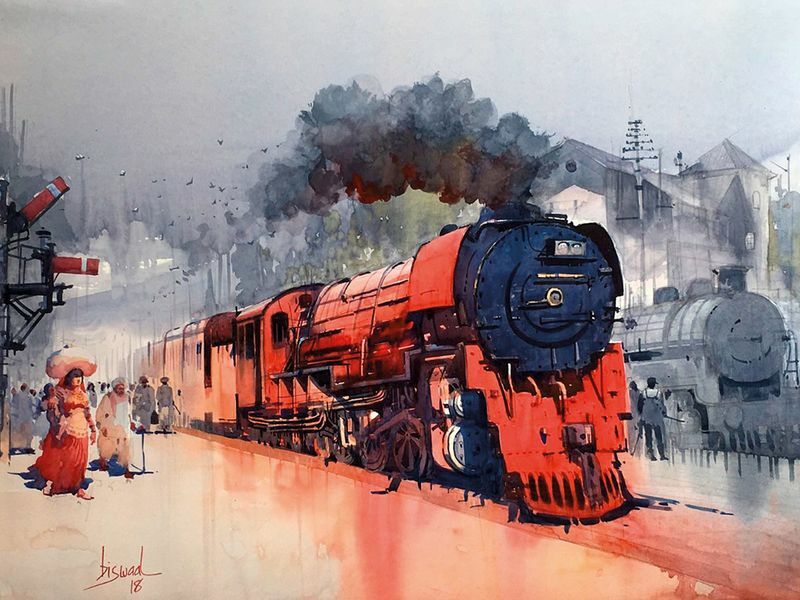 Soon, art lovers snapped up his railway-themed paintings. “The railway authorities suddenly woke up to my art and my works were shared on official websites,” he laughs. But you never sought to learn any skills from any prestigious art college? “Guidance from good masters helps minimise mistakes and your growth as an artist speeds up; but if you are passionate about the medium; you can still create miracles by just being self-taught,” Biswaal replies. Even though painting has been a part of his life since his childhood, Biswaal adopted it professionally from 2011 onwards. “I never see painting as a source of income. The purpose has never been to sell and make money out of a painting. The process of touching the canvas with a coloured brush is nirvana for me. Being a railway man explains my subject of choice, but I have painted every subject under the sun,” he says. Biswaal has been influenced by painter Raja Ravi Verma and cartoonists RK Laxman and Ajit Ninan. Apt at drawing cartoons and caricatures, he once nursed the ambition of becoming a professional cartoonist. After serving the railways for 26 years, Biswaal took early retirement from a field job as a chief ticket inspector in 2017. “I was finding it difficult to cope with the job along with my passion for painting. It was not feasible taking leave off and on for my engagements in and outside the country, as I am constantly invited for exhibitions and shows. But I must say that leaving the railways does not mean I have been derailed! My role model was and still remains the railway platforms, which gave me a distinct identity and all the accolades that followed,” he says. Nilima Pathak is a journalist based in New Delhi.